We met day two of E3 2018 a little more prepared. Our feet were up, our popcorn was popped, and our beverages were ice cold. Microsoft, on the other hand, had a little sweat on their brow. There was a lot riding on this year’s E3. After being at the top of the food chain for the majority of the previous generation of consoles, this generation saw Microsoft stumble straight out of the gate. It was only when former Head of Xbox, Phil Spencer — now Executive Vice President, Gaming at Microsoft — stepped in to right the ship that the Xbox brand started to become the brand its fans needed it to be. However, with all of the great and methodical moves Microsoft had made under his watch, the villain of his story was time. Great games take a long time to build, and what had become apparent in the widening gap between Microsoft's Xbox One and its rivals, the PlayStation 4 and Nintendo Switch, was that decisions those companies had made years ago were coming to fruition now, whereas Microsoft was seemingly just getting started. And as if on cue, Phil Spencer tweeted this out on the eve of the press conference letting us all know, he too knew what was at stake. But was excited to meet the skeptics head-on. Enter Microsoft’s E3 2018 press conference and our favorite moments. You know, for a second there, we thought we were getting a game about talking animals who—is that the Master Chief?! Microsoft's first-party studio 343 Industries took over developing duties from Bungie with the release of Halo 4, which was fairly well received. Halo 5 on the other hand, fractured the fanbase. It cast aside well-established hallmarks of the franchise’s identity, the main character took a back seat to his own narrative amidst a controversial marketing campaign, and for the first time in the franchise’s history, the word “Halo" had more to do with Beyoncé than the cultural phenomenon that inducted Microsoft into the gaming community more than a decade ago. But Halo Infinite posits that the next chapter in the series could change everything. Not much is known about the game beyond the trailer nor do we have a release date. But, if news about how they handle announcements from Microsoft is any indication, they’ve given 343 Industries all the time they need to make Halo’s return to the zeitgeist worthy of its legacy, and that we may be closer than we think to the Master Chief's return. Is there a world where Crackdown 3 lives up to the hype after a series of delays? Yes, because Terry Crews says so. It’s not uncommon for video games to be delayed, canceled, or to go through some variation of a mid-life crisis. Crackdown 3, however, has almost come out several times now. And the footage that has been on loop during every major “the state of Crackdown 3” conversation was starting to look a little dated. Thankfully, when Terry Crews's voice enthusiastically tells you just how cool being his character in Crackdown 3 is going to be, and you can tell with your own eyes that extra development time is already paying off graphically, you realize good things can come to those who wait. Fingers crossed that Crackdown 3 makes its new release date in February 2019. Time to tune up that accent you think is 100% accurate. Forza Horizon 4 is drifting into Britain. Anyway, if you made E3 2018 predictions, this was a pretty safe bet. What we did not expect is that this E3 would focus so much on weather effects and shared world experiences. All the seasonal weather effects that you are experiencing in your game are also being experienced in real-time by gamers just like you — based all around the world. Which means the way we all share how much we hate traffic in real life will now be a thing we can share in video games too. Shared world. Shared misery. A friend is a friend. This one drifts onto your Xbox this October. Phil Spencer pulled a rabbit out of a hat, and then pulled four more rabbits out of the same hat. And by rabbits, we mean first party studios. The narrative of “where are the Xbox One exclusive games” has become deafening. Spencer addressed this head-on and declared that Microsoft is creating a brand new AAA studio called The Avengers Initiative. Not only that, they had acquired four additional studios including the aforementioned Playground Games. The expectation from the audience was that this was going to be followed by the announcement that all of these studios have a brand new AAA title that’s already ready and available just like Cloverfield 3 magically appeared on Netflix. 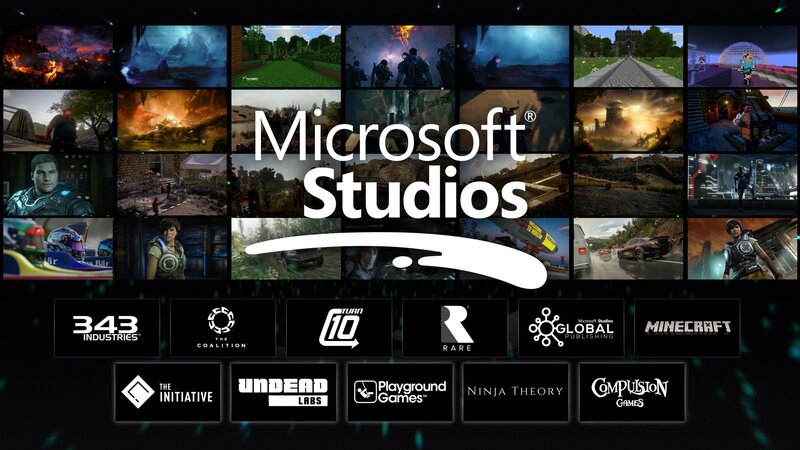 But it doesn’t take a rocket scientist to know that the newly acquired studios are most likely thinking about launch titles for the next Xbox. Bittersweet, but Microsoft's focus is on their future, and knowing that's focussed on the gamer from the ground up is genuinely exciting. We’re pretty sure we got trolled by The Coalition, but we forgive them. You know that moment when you open a gift from someone you love and realize in a microsecond you want nothing to do with what you’re unwrapping? But you wear that smile like you know this is the take that’s going to win you the Oscar? Yeah, it was kinda like that. Not because Gears Pop is not something we’re gonna play, cause, we’re gonna play it. That got announced first. And not because Gears Tactics were not the droids we were looking for. Because they were. That got announced next. But because for a second there, Microsoft and The Coalition made us believe Gears of War 5 wasn’t gonna happen this year and frankly…well played, team. Well played. Gears of War 5 looks to be the first in the series that takes place after any sort of war. As exemplified by it actually being called “Gears 5.” It also looks to be the most emotional. On the surface, the “bro shooter” may seem only skin deep. But rest assured, if you haven’t dabbled, the game has evolved quite a bit since the first entry and has seen key characters deal with the real-world consequences of war. If what little we’ve seen of this entry so far is any indication, the Gears universe will be getting even bigger as the focus now shifts from the Fenix family to a new one and as a franchise first, will feature a female protagonist. Just because they're quiet, doesn't mean they've gone dark. In a blink and you’ll miss it a moment, Spencer mentioned that Microsoft is already hard at work on architecting the next Xbox, but something else he said really got us thinking. He mentioned that they are going to be harvesting the power of Microsoft’s AI technology for gaming. Why this is huge deal is because this marks a paradigm shift in the inner workings of Microsoft. The past few years have seen the gap between Windows 10 and Xbox getting smaller and smaller. Phil Spencer used to only be the Head of Xbox, and now is the EVP of Gaming for all of Microsoft. This could mean that Microsoft — as exemplified by the acquisitions — is ready to put the full might of the company's resources behind the Xbox brand. And this is incredibly exciting because Spencer’s every decision seems to be in service of people who play video games above all else. The fact that he’s bringing Microsoft AI into the gaming space could mean for the first time in gaming, we may be looking at in-game experiences where characters dynamically interact with you, enemies that plot against you, and friendships that have to end with you lowering your robot best friend into boiling steel with tears in your eyes as they give you the thumbs up. I’mma let you finish, but CD Projekt Red had the greatest reveal of all time. We were starting to wonder if Cyberpunk 2077 was a Mandela effect kinda situation. Many of us remember seeing the original trailers years ago, and then…not much else. Was this game canceled or did it come out already? Was it just on a platform we simply overlooked? And then in the middle of Spencer’s final words, when it looked like his speech had gotten hacked, and everyone (just me actually) thought, the Riddler had struck again...we got what may be one of the most visceral re-introductions to an IP ever. We are living through a time of reboots, remakes, sequels and remasters. But Cyberpunk 2077 is one of only a few new AAA IPs we've seen so far and we can't wait to learn more.